The warm weather has finally arrived! Do you know what that means? BBQ season! Yes, it’s time to invite your friends and family over for some delicious food, great company and maybe a water balloon fight or two. One way that I know summer is on its way is the delicious smell of the BBQ food throughout the neighbourhood. Do you make a delicious burger? Perhaps you have a recipe for a pasta salad that can’t be beat. 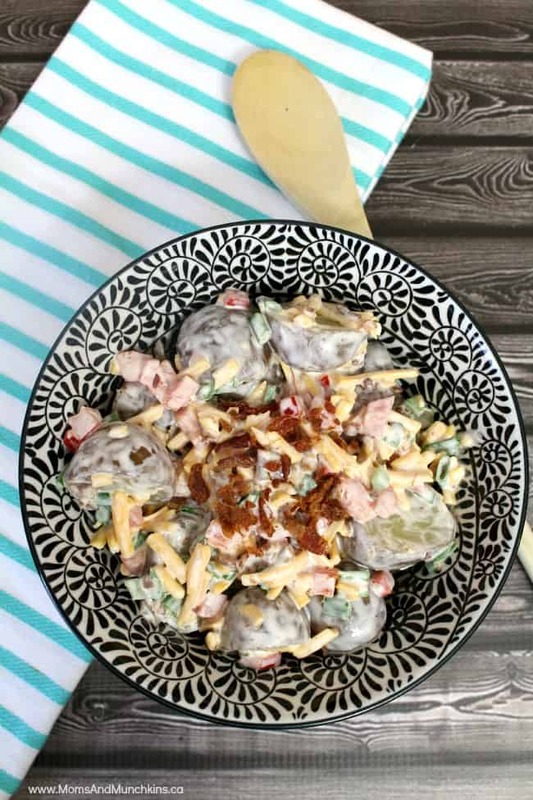 One of my favourites is always the potato salad and with the BBQ season now here it is time to try some new potato salad recipes. My favourite place to go for new recipe ideas is LifeMadeDelicious.ca. All of the recipes are easy to follow and they all include a delicious picture. So with a little search on “potato salad recipes”, I came up with two new recipes to try and I’ll share them both here with you. When you order a baked potato at a restaurant, do you ask for them to bring out the tray with all the delicious toppings? 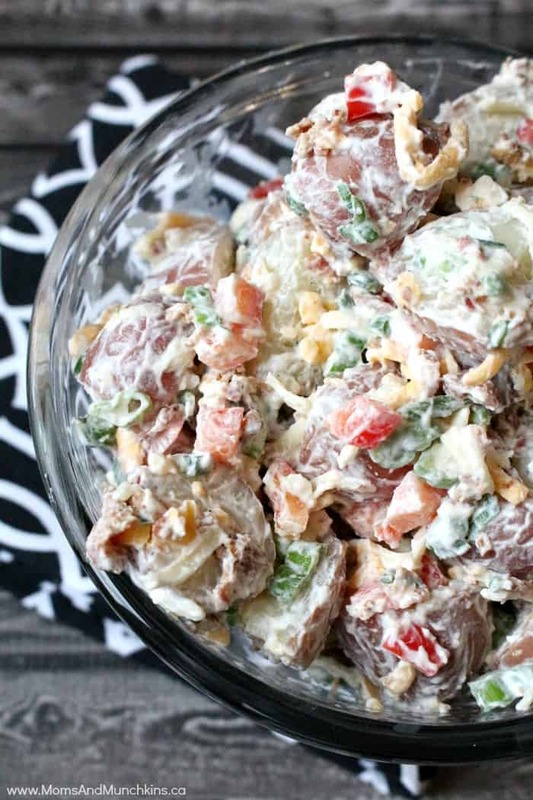 Then you’re sure to love this Loaded Potato Salad. If you love baked potatoes with all the toppings then you are sure to love this delicious loaded potato salad! Place potatoes and water in a large microwavable bowl. Cover and microwave on High 8 to 10 minutes or just until potatoes are tender. Stir in chives, butter, salt and pepper. Refrigerate uncovered 10 minutes (cool potatoes completely). In small bowl mix sour cream, mayonnaise and milk. Stir sour cream mixture, bacon, bell pepper and cheese into potatoes. Serve immediately or cover and refrigerate until serving time. 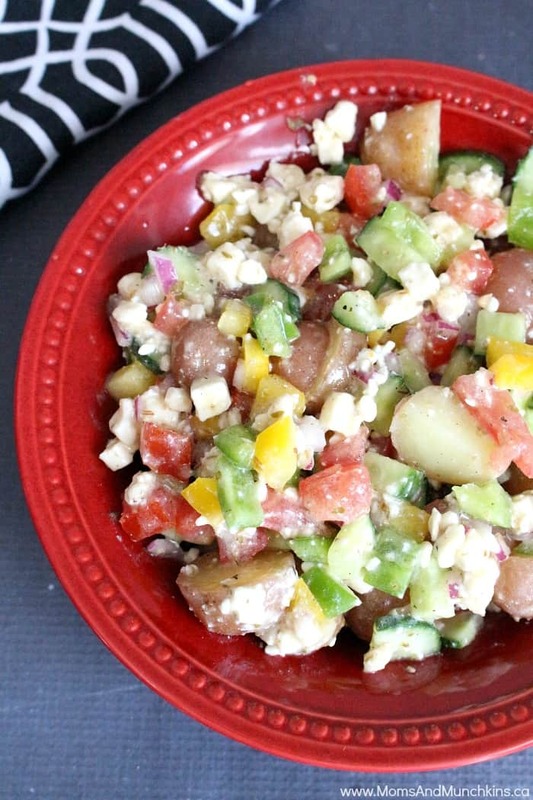 I love Greek salad so I knew I’d love this potato salad version. It’s so delicious that you forget that it’s good for you too! You’ll find the Greek Potato Salad recipe here. 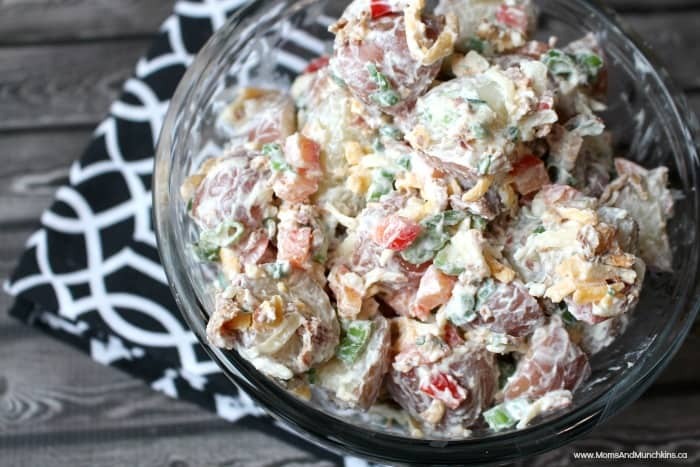 Do you have any favourite potato salad recipes? Want to share your secret ingredient? Let us know in the comments below. For more delicious ideas, follow us on Facebook, Twitter, Pinterest and Instagram. I do make a mean hot potato salad (German)! Sounds like an absolutely delicious potato salad!!!! Love all the different vegetables and feta that you added, sounds like the salad has delicious flavor! Perfect salad for the summertime! YUM! Im pinning this now!! It really is delicious – I hope you enjoy it too! I cannot wait to make these!!! Thanks so much for sharing. This looks perfect for summer barbecues! Thanks for linking up with What’s Cookin’ Wednesday!